Sunset Arch rises from a sagebrush and slickrock flat in the Grand Staircase-Escalante National Monument in Utah. President Trump speaks at the Utah State Capitol on Monday before signing a proclamation to shrink Bears Ears and Grand Staircase-Escalante national monuments. Bruce Adams, chairman of the San Juan County Commission, says he's glad President Trump is considering shrinking monuments across the American West. President Trump has dramatically scaled back two national land monuments in Utah. 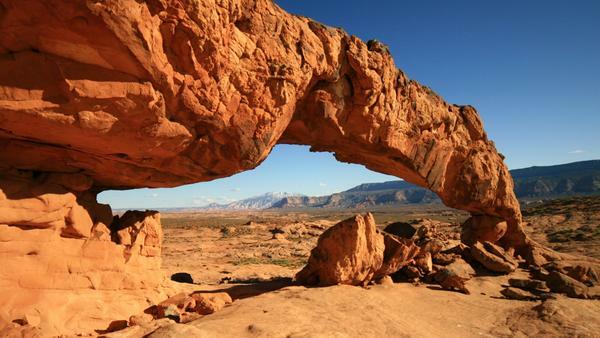 The administration and Republican leaders in Utah say taking the land out of the hands of the federal government will allow the state to decide what to do with it, including protecting some areas and possibly allowing development in others. As expected, environmental and Native American groups were outraged. Patagonia, which sells outdoor clothing and gear, splashed a statement across its website reading "The President Stole Your Land" and calling Trump's move "illegal." The battle over Trump's authority to shrink monuments may be just beginning. Native American tribes and conservation groups are mounting legal challenges, even as the administration turns its focus to possibly shrinking half a dozen more in other states. 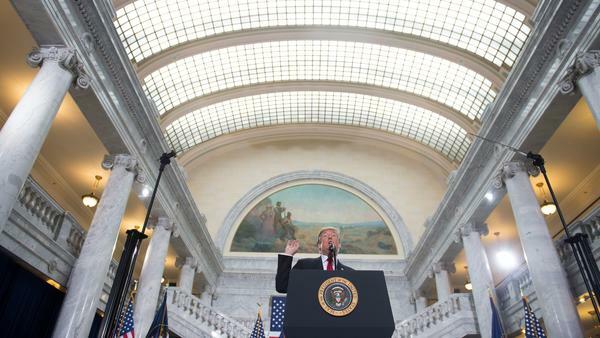 Before President Trump even finished his triumphal visit to Utah Monday, the first lawsuits were being filed. At the center of this sage brush battle is a relatively obscure federal law called the Antiquities Act. Signed by President Teddy Roosevelt in 1906, it was intended to stop the pilfering of ancient Indian artifacts from public land. But it also gave presidents the authority to create national monuments on their own, without Congress. Here in Utah, where about two-thirds of the entire state is federally owned and there are seven large monuments, the act is a household name, and in some rural areas, a dirty word. "I've become an expert in monuments," Interior Secretary Ryan Zinke said at the Utah Capitol on Monday. "And the Antiquities Act was never intended to prevent, it was intended to protect." When the administration began its controversial review of 27 large monuments, including Utah's Bears Ears and Grand Staircase-Escalante, it said the act needed to be tested. Tribes and conservationists have been preparing lawsuits for months. "There is nothing in the Antiquities Act that authorizes a president to modify a national monument once it's been designated." says Ethel Branch, attorney general for the Navajo Nation, one of the tribes that is suing the administration. The tribes point to a federal lands law from the 1970s that says only Congress can actually reduce or nullify a national monument. Previous presidents have made small reductions to monument boundaries, but never until Monday had one used the Antiquities Act to so dramatically shrink them. But there's another tricky issue here. The Antiquities Act also expressly states that presidents should protect the important sites while using the smallest amount of land possible. That's partly why there was so much opposition to Bears Ears, which originally was 1.3 million acres in size. "It was more about control than it was about protection," says San Juan County Commission Chair Bruce Adams. He's ecstatic that President Trump is trying to shrink monuments across the rural West. He says these designations take everything off the table, like expanding cattle grazing or mining. Trump, he says, "listened to the local people, even though they weren't millions of voters, only 15,000 people in our community. He understands what rural communities are about." The administration is also considering shrinking national monuments in states like Nevada and Oregon. If it presses forward, more legal challenges are sure to follow. All right, President Trump has dramatically scaled back two large areas of land that had been designated national monuments in Utah. But a battle over his authority to do this may be just beginning. Native American tribes and conservation groups are mounting legal challenges even as the administration considers shrinking half a dozen more monuments in other states. Here's NPR's Kirk Siegler. KIRK SIEGLER, BYLINE: Before President Trump even finished his triumphal visit to Utah yesterday, the first lawsuits were being filed. At the center of this sagebrush battle is a relatively obscure federal law called the Antiquities Act. Signed by President Teddy Roosevelt in 1906, it was intended to stop the pilfering of ancient Indian artifacts from public land. But it also gave presidents the authority to create national monuments on their own without Congress. Here in Utah, where about two-thirds of the entire state is federally owned, and there are seven large monuments, this act is a household name. And in some rural areas, it's a dirty word. RYAN ZINKE: I've become an expert in monuments. SIEGLER: Here's President Trump's Interior Secretary Ryan Zinke speaking at the Utah Capitol yesterday. ZINKE: And the Antiquities Act was never intended to prevent. It was intended to protect. SIEGLER: When the administration began its controversial review of 27 large monuments, including Utah's Bears Ears and Grand Staircase-Escalante, it said the act needed to be tested. Tribes and conservationists have been preparing lawsuits for months. ETHEL BRANCH: There is nothing in the Antiquities Act that authorizes the president to modify a national monument once it's been designated. SIEGLER: This is Ethel Branch, attorney general for the Navajo Nation, one of the tribes suing the administration. The tribes point to a federal lands law from the 1970s that says only Congress can actually reduce or nullify a national monument. Previous presidents have made small reductions to monument boundaries but never until yesterday had one used the Antiquities Act to so dramatically shrink them. BRANCH: There is not room for a subsequent president to come in and second-guess that authority. SIEGLER: But there's another tricky issue here. The Antiquities Act also expressly states that presidents should protect the important sites while using the smallest amount of land possible. That's partly why there was so much opposition to Bears Ears, which originally was 1.3 million acres in size. BRUCE ADAMS: It was more about control than it was about protection. 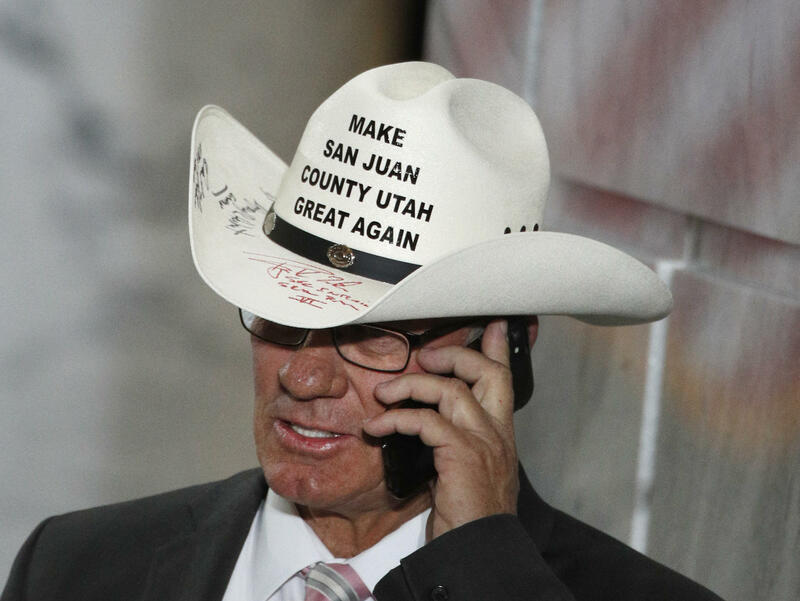 SIEGLER: San Juan County Commission Chairman Bruce Adams is ecstatic that President Trump is trying to shrink monuments across the rural West. He says these designations take everything off the table, like expanding cattle grazing or mining. ADAMS: He listened to the local people even though they weren't millions of voters, only 15,000 people in our community. He understands what rural communities are about. SIEGLER: The administration is also considering shrinking national monuments in states like Nevada and Oregon. If they press forward, more legal challenges are sure to follow. Kirk Siegler, NPR News, Salt Lake City. (SOUNDBITE OF NEIL YOUNG'S "GUITAR SOLO, NO. 2") Transcript provided by NPR, Copyright NPR.